Presenting in front of a captive audience is hard. It takes more than natural talent. It takes a plan and preparation. 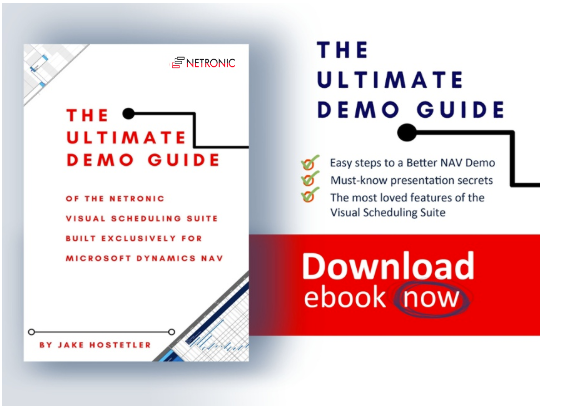 NETRONIC built the Visual Scheduling Suite exclusively for Microsoft Dynamics NAV to help users gain operational agilty with visual scheduling, and as such to further empower an already powerful ERP system. I've put together this blog post to help you take your visual scheduling demo to the next level. So when preparing for a demo to show visual scheduling in Microsoft Dynamics NAV, make sure you grab this checklist. The following steps will help you take your demo from average to outstanding. In the world of enterprise resource planning software, prospects and customers will express the concern that they do not wish to have another add-on which is running alongside their NAV system. They complain that they do not wish to learn yet another software and system and understandably so. After a certain point, it can become excessive not to mention cumbersome with so many different applications performing so many different functions. The goal of an ERP System after all is to help centralize data processing. It is exactly for this reason that the NETRONIC Visual Scheduling Suite was built not as add-ons but as add-ins which fully integrate into Dynamics NAV. The following six steps highlight the most critical features of the NETRONIC Visual Scheduling Suite. Make sure you build your visual scheduling demo around these steps: it will take your demo from average to outstanding. An extensive version of this checklist is provided with our ultimate demo guide, which I introduced in my blog "What's the best question to ask during a visual scheduling demo?". Hence, for a detailed list of all six steps, download the demo guide below.